There are several discount passes and coupons available. The HolyPass (www.holypass.co.il) offers 10-25% savings at hundreds of participating entertainment venues, restaurants and attractions. The Old City Bites Card (www.haatika.co.il/en/) and the Machane Yehuda Bite Card (www.machne.co.il) allow visitors to sample the tasty delights of the Old City bazaars and Machane Yehuda Market respectively. Also worth checking out for deals on meals and attractions is AngloDeals (www.anglodeals.co.il). Accessed by the towering, bullet-ridden Zion Gate that leads from the Armenian Quarter, Mount Zion’s wealth of religious and historic relics is a necessary stop in any tour of Jerusalem. The main sites are King David’s Tomb, one of Judaism’s holiest sites, as well as the Cenacle room within the compound believed to be the site of the Last Supper. Dominating the Old City is the golden Dome of the Rock, Jerusalem's most recognisable landmark. The spacious, tree-studded complex contains the third holiest and second oldest site in Islam: the Al-Aqsa Mosque. Here, according to the Koran, Muhammad ascended to heaven. The dome and mosque are closed to non-Muslims, but the complex itself is a wonderful place to visit. Modest dress is mandatory. Closed during all prayer times (variable); otherwise Mon-Thu 0830-1130 and 1330-1430 (summer); Mon-Thu 0730-1030 and 1230-1330 (winter). No (for Temple Mount; charge for Dome of the Rock, Al-Aqsa Mosque and Islamic Museum combined ticket). Revered as the holiest site in Judaism, the Western Wall is all that remains of the Second Temple. It is here that millions of Jews travel from all over the world to pray, pushing prayer notes into the wall’s cracks. It is divided into two prayer sections, men on the left and women on the right, and modest dress is mandatory. Telephone: +972 2 627 1333. The Via Dolorosa (Road of Sorrow) is the route Christians believe Jesus walked on the way to his crucifixion. It begins at the Lion's Gate, passes through the Muslim Quarter and leads to the Church of the Holy Sepulchre, marked along the way by the 14 Stations of the Cross. Every Friday, hundreds of Christians process through the winding streets in remembrance. Containing the last five Stations of the Cross, this is the holiest Christian site in Jerusalem. Inside the cavernous, ornately decorated and dimly lit church, a small stairway leads to the Chapel of Golgotha where Christians believe Jesus was stripped, crucified and removed from the cross. The Sepulchre, at the centre of the church, marks where Jesus was buried and resurrected. Telephone: +972 2 627 3314. Mon-Sat 0500-2100 and Sun 0500-2000 (summer); every day 0400-1900 (winter). Yad Vashem (The World Holocaust Remembrance Center), on the western edge of Jerusalem, charts the devastation wreaked upon Jews by the Nazis during WWII. Its superbly documented displays are as moving as they as are horrifying. Most poignant is the Children's Memorial, where, in a dark underground chamber, names from the list of 1.5 million murdered children are continuously read aloud. Telephone: +972 2 644 3400. Sun-Thu 0900-1700 (2000 on Thu), Fri and holiday eves 0900-1400. 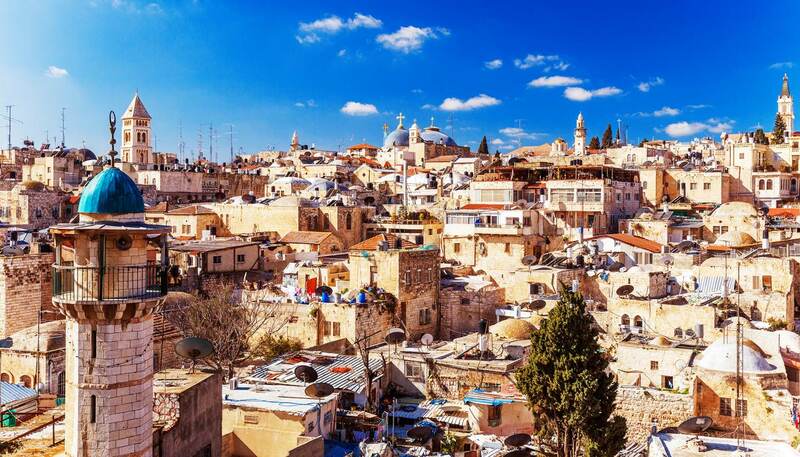 This attraction provides an extraordinary glimpse of Jerusalem's past. Archaeological excavations revealed thrilling biblical finds including the underground Gihon spring and a 2,700-year-old water tunnel. A walk through the 533m-long (1,748ft) Hezekiah’s Tunnel is one of the highlights of a visit, and there’s also an excellent 3D movie depicting the history of the site. Sun-Thu 0800-1900, Fri 0800-1600 (summer); Sun-Thu 0800-1700, Fri 0800-1400 (winter). The Old City, usually accessed via the Jaffa Gate, is the jewel in the crown of ancient Jerusalem. This living museum of 0.9 sq km (0.35 sq miles) is the meeting point of three world religions—Judaism, Christianity and Islam—and the site of some of history’s most significant events. The four quarters—Christian, Jewish, Muslim and Armenian—each have a fascinating and very distinctive atmosphere. Despite its name, the tall, slender stone tower rising from the Old City Walls has no connection to King David (the city's founder), and was constructed in the first century BCE as a fortress for Herod the Great. Today, it houses the outstanding Museum of the History of Jerusalem and a nightly spectacular sound and light show is held on the grounds. Telephone: +972 2 626 5333. Sun-Thu 0900-1600, Fri and eve of holidays 0900-1400, Sat and holidays 0900-1600. Israel’s largest museum complex is renowned for its archaeology, anthropology and art. Highlights include the modern sculptures of the Art Garden, the 20th-century artworks of the Art Pavilion and the Archaeological Galleries. Inside a striking separate building shaped like an earthenware jar is the greatest treasure, the Dead Sea Scrolls, discovered beside the Dead Sea at Qumran in 1947. Telephone: +972 2 670 8811.